This is a forum for boaters to gain information from a certified surveyor. An acknowledgement by the receiving charity, that it will make a significant intervening use of the boat or yacht, a detailed statement by the charity of its intended use, the duration of that use and a certification that the boat or yacht will not be sold for a period of at least three years. An acknowledgement by the receiving charity that it intends to make material improvements to the boat or yacht increasing it’s value, a detailed description of the intended material improvements and a certification that the boat or yacht will not be sold before completion of the improvements. An acknowledgement by the charity that it intends to give or sell the boat or yacht to a needy individual(s) or to a charitable institution at a price significantly below fair market value. This provision applies only if the gift is in furtherance of the charity’s purpose. Most charities will provide the acknowledgment required by submitting to the donor and to the IRS form 1098-C. If the charities acknowledge on this form one of the four exceptions noted above, then the donor is entitled to take the full appraised value of the yacht or boat as a charitable deduction on their Federal and possibly State tax returns in the year in which it was donated. Any yacht or boat having a fair market value in excess of $5,000.00 must have a written appraisal by an Accredited & Certified Marine Surveyor. Currently, the donor of a vessel with an appraised value in excess of $5000 submits an 8283 and 1098C tax form to the IRS showing the appraised value verified by an Accredited & Certified Marine Surveyor and the intended use by the charity. I have these forms which the charity receiving the vessel, must sign and certify that it will not sell the vessel within three years. The exception to this three year rule is if the donor accepts the immediate sale price realized by the charity as his tax deduction for the donation. After three years there is no reporting requirement as the donated asset is considered depreciated to a point where the appraised value is no longer meaningful. If for some reason the IRS should take the gigantic step of completely changing their existing procedures and tax forms for charitable donations of yachts, ships & boats, I would be notified immediately. Donating your boat, yacht or commercial vessel is still a very viable financial alternative to an actual sale with many tax advantages. Make sure that if you or your client will be donating a yacht, ship or boat it will be stated in writing, that the foundation will keep the boat or yacht for three years. Please call me if you have any questions about the new tax law and how it might relate to donating a boat, yacht or ship. To date I have appraised 1,075 yachts, boats and ships nation wide. The color and quantity of exhaust smoke tells a great deal about the condition of a marine diesel engine. All marine engines create smoke to some extent, but if the diesel engine is in good condition, the quantity will almost be invisible. Defects that affect the fuel, breathing or compression will prevent correct combustion and lead to excessive exhaust smoke. Black Smoke is caused by partially burned fuel. When the fuel/air mixture increases there is insufficient oxygen present in the cylinders to complete the combustion process. Large quantities of carbon are then produced which appear from the exhaust as minute black soot particles. Engines with turbochargers have additional sources of black smoke. Steam: If you are not sure whether the white cloud from the exhaust is smoke or steam then watch how it dissipates. Steam or water vapor will rise and clear fairly quickly especially in warmer temperatures. Smoke tends to stay closer to the water and take longer to dilute with the local breezes. White exhaust smoke: Unburned fuel that can be caused by excessive fuel or poor combustion. Note: Excessive periods at idle can cause a build up of unburned fuel within the exhaust system that will burn off in the first few minutes the next time the engine is operated under normal power. This condition is normal for diesel engines and common in sailboats that idle for lengthy periods charging batteries or running freezers. I recommend sterndrive/OutDrive unit maintenance every 50-65 hours. To most boaters here in our New England coastline and lake regions, this equates to once per season. The best time to perform this service is the same time you haul out to winterize your boat. If you exceed 65 hours per boating season, I will still recommend you to stick to the 50-65 hours and service your drive(s) when you winterize at the end of the season. Servicing your outdrive not only performs a required maintenance function but it also can give you insight into the condition of your internal drive components. Water is a major enemy of drive units. Water in a unit, that has been recently run, will cause the oil to look milky. An outdrive that has set for a few days and had time to separate will drain water first and then the oil. Remember oil floats on water. Also check the tip of your magnetized drain plug and the oil itself for metallic shavings. this magnetized drain plug is located at the bottom of the outdrive housing just below the prop. Its not abnormal to have some very fine particles, demonstrating normal wear or break in, but larger pieces are a sign of serious problems. Any indication of water or excessive metallic fines should be brought to the attention of a qualified marine mechanic immediately. It also important to stress the absolute need to follow drive service recommendations for new outdrive units. This even applies to older boats that have had their drives rebuilt, replaced or repaired. Manufacturers recommend a 20-hour break in period at no more than 2/3 throttle and no extended high rpm runs. At the end of the twenty hours, service your outdrive units as suggested. This time you can expect to see more metallic files. This is normal, as the gears are seating and rounding off some of their square edges. The problems start to occur when the water molecules migrating into the GRP (fiberglass) encounter other chemicals inside the laminate, primarily water-soluble materials (WSMs) such as the emulsion binders used to hold the fiberglass mat together before it is moulded, or pockets of uncured or partially cured resins in the hull mould. The water molecules can have a chemical reaction with these substances, forming larger molecules of a new chemical, often acidic - which unlike the original small water molecules, can not carry on passing through the GRP. These larger molecules are then trapped. This is the point at which osmosis actually starts. The important parts are that the hull is not waterproof (it is a semi-permeable material), and that osmosis causes a low concentration fluid (water) to pass through the hull to join the higher concentration fluid (the chemical mix formed by the water plus WSM) inside the fiberglass laminate schedule. Pressure is thus built up inside the laminate. If this process takes place in a solid part of the laminate, there is usually no problem as the structure is strong enough to contain the pressure. If however it takes place on the boundary of a small air-bubble in the moulding, or at a point where layers of fiberglass are not properly bonded, the new chemical compounds slowly fill up the bubbles or the very small gaps between layers with liquid. Almost all mouldings have these air bubbles and small areas of poor bonding, although they should not. Ideally the resin should totally fill the gaps between the fiberglass strands, and every layer should perfectly bonded. This is extremely difficult to achieve with conventional moulding techniques. The process of osmosis in a fiberglass hull is very slow, unless the moulding is a poor lay-up schedule, and no matter how long it remains in water a typical fiberglass laminate cannot absorb more than about 2-3% of it’s own weight of water. If this osmosis (using the term in a correct manner) was all that happened, it would be a very minor problem. Even completely saturated with water molecules, a fiberglass laminated hull still retains most of it’s strength, although it does become slightly more flexible. Racers who want stiff hulls with the absolute minimum weight already mostly keep their boats ashore when not sailing, and for any properly built cruising boat 2% or so extra weight and a trace more flexibility in the hull-structure should not be a problem. Once again, if the air bubble simply filled with this acidic compound, the problem would still be relatively minor. However the nature of the osmosis process is that water molecules keep osmosing through the fiberglass laminate, and join the chemicals in the bubble, steadily building up hydraulic pressure. Eventually this causes the surface of the moulding to blister. These blisters are the typical sign of what I refer to as ‘osmosis’. When pierced these blisters will give off a small amount of chemical-smelling (usually vinegary) liquid - which is the juice built up inside the pressure-raised blisters. The term ‘blister juice’ is often used. This ‘blister juice’, which is usually acid, can break down the polyester. This breakdown process is known as hydrolysis, and causes a reduction in strength of the laminate. This is however normally very localized, and the moulding as a whole will still retain most of it’s strength despite blistering. Only if the blisters are very large, or very deep-seated, is this generally a problem. Hey Rob, Can I be present at the survey when you perform the diesel engine tests? No problem, I welcome all my clients to be present but leave the relatives and the in-laws at home; especially the brother-in-law shade-tree mechanic. Opening all hatches to gain access to the engines and my run-up diagnostic testing, is very serious and these areas are dangerous. My Diesel Fuel Testing Identifies Contamination in Fuel. Most marine diesel engine problems I am seeing recently are related to fuel problems on both commercial vessels and yachts. Diesel fuel contamination problems have two different categories, biology and chemistry. Thinking you have a chemical problem when you have a biological problem and treating it with the wrong chemical will not solve your problem but compound it. The approach of the local boat store salesman telling you “this will solve your problem” after you have tried other chemicals may create a bigger problem. The most prominent problem is chemical and lies in the creation of "asphaltene." Asphaltene or in simpler terms, diesel sludge looks like algae but there is no algae in diesel fuel. Asphaltenes are created by either the natural aging of diesel fuel, by simply adding fuel additives or mixing perfectly good clean fuels from two different suppliers. The other common problem that affects diesel fuel is a biological problem called fuel bugs. There are many types of fuel bugs which are also bacteria and fungus that can live in diesel fuel. A small amount of water from either condensation or from entering the tank through a vent can start an ideal fuel bug condition. The growth is alarming and creates a filter-clogging situation in just a few days. To identify these fuel problems so the proper fix can be recommended, I conduct two tests. A simple, low cost fuel test kit for biological contamination and a lab package to identify fuel instability. The test kit is a simple dip slide. The slide comes in a plastic tube and is attached to the cap. Within 24-36 hours I can detect bacteria or mold in your diesel fuel tanks. If the fuel is contaminated the fuel tanks and related fuel lines will need a biocide treatment. My Lab Package offers Diesel Fuel Stability Test # HLOO-0021. This program will indicate if the fuel is up to ASTM standards and if there is an unwanted rapid degrading taking place in the fuel. If the fuel indicates chemical instability I will always offer solutions to the problem. Rob Scanlan, CMS/MMS/ACMS conducts computer engine analysis and compression testing on gasoline and diesel engines as well as engine oil analysis and fuel analysis on yachts, ships, pleasure and commercial vessels. environmental restrictions; the list goes on and on. much or take so much time to prepare for, to clean up after, etc. the incredible costs involved in boating. accurate and precise � the figures do not lie. efficient, most economical speed is called �Cruising Speed�. gallon of gasoline at the marina is $3.25 per gallon. costs; if you keep the engines at the �Cruising Speed�. �Can you hear me now� throttle-jockeys ? if and if and if ---. Now comes the storage, winterizing, covering and spring commissioning. $5,250.00 - $6900.00 per year; lets say $6 grand to make the figures easy. Today�s crude oils have increased viscosity and density, along with a higher concentration of impurities and water, which are not removed during the refining process. Higher levels of asphaltene and carbon residue are also present. These factors contribute to a wide range of storage, handling and combustion problems, often creating undesirable combustion byproducts. This combustion byproduct can be carbon build up on marine engine parts and exhaust pollution (NOx). These refining issues translate into two types of diesel fuel problems that I find on pleasure yachts and commercial vessels, those that are here now, that you can see and those that are waiting to happen. You can be proactive and treat the problem or just accept it as a cost of doing business. Fix the fuel problem and increase the bottom line or ignore it and replace equipment when you think it is time. Diesel sludge aka �algae� is in fact asphaltene. Asphaltene is naturally occurring impurities found in all diesel fuel. Asphaltenes are insoluble in diesel fuel. This means they will not magically dissolve in your fuel. Bacteria and mold are also problems that may occur. For these problems you must have water in the fuel. These biological type problems ONLY grow at the point where the fuel and water meet. Some crude oils have higher levels of asphaltene than others. The end product, the diesel you buy varies in asphaltene content. Unless you know the chemistry of the crude oil you have no clue as to the amount of solids in your fuel from day to day. The higher the concentration of asphaltene in the crude oil, the longer the molecular chain of asphaltene. Longer chains are bigger. They all stick together. Once stuck together they do not burn efficiently. They cause engine smoke and they clog filters. This is usually found in fuel tanks on sailboats I have surveyed. There are two options to deal with asphaltene, chemically or mechanically. Chemicals must be the correct chemical to break up the molecular chains. Read the label on your chemical treatment and see if it mentions �asphaltene� or diesel sludge. Then ask your marina what the know about it and how the marina treats it. You may be surprised by the answer. Mechanically does not mean filtering out the large particles though, it is part of the equation. Asphaltene particles reduced to 3-to-5 microns in size and evenly blended will burn more evenly producing more power, less smoke and will make your sludge problem go away over time. Smaller fuel droplets are injected. Improved combustion is achieved resulting in fewer carbon deposits, lower equipment maintenance costs and can lead to a significant reduction in nitrous oxide (NOx) emissions. Dieselcraft of Auburn, CA has developed a proven two-stage fuel purification system to deal with the asphaltene. The system �homogenizes diesel fuel. It removes large solids and water plus reduces the asphaltene particle size as shown in the following lab test results. All particles from 100 micron to 6 micron were reduced where particles smaller than 6 micron were increased, indicating the effectiveness of the system process. One of the many tests I do in my computer engine analysis and compression testing surveys, is testing the fuel. Rob Scanlan is an Accredited & Certified Master Marine Surveyor covering Maine to Long Island, NY. Rob, I met you the other day at Marina Bay while you were doing the computer engine testing on the yacht next to ours. What is compression testing ? Compression is a process in which air/fuel mixture is confined and pressed into a smaller volume within the area of engine cylinders. This process forces all of the molecules to be "pressed" together under high pressure. In the case of a gasoline engine, moderate compression is required, 140 to 160 pounds per square inch (PSI). Some marine engines require as much as 220 PSI depending on their size and application; the manufacturer gives specific compression specifications. on this compression process to ignite the diesel oil. Diesel engines are much heavier and louder compared to the gasoline engine due to the higher compression. This compression process, combined with an air/fuel mixture and a source of ignition, is what produces the necessary power to run these engines in boats and yachts. Compression should be checked when any marine engine is running rough or lacking power. Compression testing on your marine engine should be performed every time a tune-up is done as part of preventative maintenance. By performing a compression test, internal engine malfunctions, such as bad valves, piston rings or excessive carbon buildup, can be detected before mechanical problems develop at sea. It benefits the boat owner to be aware of these problems so they can make an informed decision whether to invest in repairs or sell the boat. Note here that very few Marine Surveyors in the United States do compression testing or engine analysis on gasoline and diesel engines in their surveys. open the throttle to full open position to ensure the engine gets adequate air intake and insert the compression tester into one cylinder spark plug hole at a time. I then crank the engine over continually for at least five to 10 full revolutions to obtain an accurate reading on the compression tester. If any cylinder compression reading varies 10 percent or more, a problem may exist in one or more cylinders. If the variance is greater than 10 percent, I get into specialized testing equipment I have onboard my truck to further diagnose the problem. If all cylinder readings are within 10 percent of each other, compression test results are optimal. (have the least compression.) The new fuel-injected marine engines, four-strokes, HPDI, FICHT, are complicated to test and I have the computer software to diagnose these engines. increases considerably, then I have found the problem. If the compression readings do not change, it would indicate a timing problem between the camshaft(s) and the crankshaft of the engine. I would recommend the timing chain or belt be checked for proper timing. If I find the compression reading is very low or zero in one cylinder, it is highly probable that internal engine damage exists such as the piston could have a broken connecting rod or a hole in it; a valve could be stuck or leaking; broken valve spring or bent push rod; camshaft may have excessive wear or not opening the valve(s). de-carbonizing process on the engine or by removing the cylinder head(s) and physically removing the carbon that is attached to the cylinder portion of the head(s) and on top of the pistons. Cruise his website for the scope of his engine analysis and compression testing programs. I have a question about your surveys for sailboats you have done for some of our club members. On the section of your survey, where you inspect the mast, rigging and sails, you have IEPJ dimensions recorded. Where do these measurements come from ? "I" is measured along the front of mast from the genoa halyard to the main deck. The main deck is where the deck would be if there were no deckhouse. to the front of the mast. bowsprit (fully extended) to the front face of the mast. or ketch measured in the same way as for the mainsail. Cod and the Islands as well as Long Island, New York. Many boaters are unaware of the difference between an automotive and a marine engine and its respective accessories. The most notable differences include the engine block casting/building, exhaust systems, cooling systems, electrical systems and the fuel systems. The engine blocks are cast/built with extra anticorrosion substances and the freeze plugs for a marine engine are brass; unlike the aluminum freeze plugs in the engine block for a car or truck. With the Cooling Systems, one of the major differences is found in the water-circulating pump. Unlike their automotive counterparts, a marine pump works in an open cooling system. This type of system is extremely corrosive to the pump so it must be altered for longevity. A marine pump has a special ceramic seal, stainless steel backing plate and a bronze impeller to resist corrosion. An automotive style pump, with its stamped steel impeller, would fail in a short time due to corrosion. The Electrical Systems in marine applications are also specialized. In an automobile, any gasoline vapors that may escape, will evaporate or vent from the bottom of the engine compartment. A boat, with its sealed engine compartment, will let escaped gas vapors accumulate in the bilge or engine compartment. Therefore, any spark could literally cause a boat to explode. All electrical components in a boat are either completely sealed or specially vented to prevent such a catastrophe. This includes the starter, alternator and distributor. Although I have only briefly touched on some of the differences between automotive and marine applications, hopefully it will serve to remind you that there are differences and the reasons for these differences need to be shared. ROB SCANLAN IS AN ACCREDITED & CERTIFIED MASTER MARINE SURVEYOR CONDUCTING COMPUTER ENGINE ANALYSIS AND COMPRESSION TESTING ON GASOLINE & DIESEL ENGINES. crucifixion and resurrection of Jesus Christ. represents the Star of Bethlehem. in the body of Christ during the crucifixion. small birds known as the Doves of Peace. Find a sand dollar shell, I will point these out to you. The purchase of a pleasure yacht represents for most people a substantial investment, similar to the purchase of a house. Unlike a car or other machine, a yacht may last for decades. Options to re-power and upgrade electronics make the yacht an item of indefinite duration with older, classic styles often preferred to shiny new models. A pleasure yacht often becomes a very personal, "living thing" with memories attached to it. Yachts, because of their high cost and their mobility, are also subject to many laws and regulations which the purchaser may not be aware of. There is no simple checklist of things to do and avoid in the purchase of a yacht. The intended use of the boat and the financial circumstances of the buyer are the main guidelines but many variables will still be involved. As in everything else, planning is very important. Unfortunately, however, the excitement of a new toy and the sales pressure of brokers often prevents a buyer from a careful analysis of the options. The following is only a general guideline of the various steps involved before and after the purchase of a yacht. For specific advice, it is recommended that a purchaser consult an attorney and an accountant familiar with yacht ownership. The first thing a potential yacht owner should do is to decide the type and size of boat he can afford and will be comfortable with. While this concept may seem obvious, it actually cannot be stressed enough. The choice of boat should be determined by the specific needs and intended use (racing, casual cruising, extended cruising, investment, charter, tax shelter, second home, liveaboard, etc.) The prospective purchaser should know exactly what he wants to do with the vessel he is purchasing. Not only is a certain type of yacht unsuitable for certain uses but the legal, financial, insurance and other requirements may be different. Certain yachts are difficult or impossible to insure as are certain skippers without experience or with negative information on their driving records. Certain vessels may not be insured for certain voyages. If co-ownership is considered, the time to plan for it is before purchasing the yacht. A sales contract is not a step to be bypassed, particularly where the yacht is an expensive one. Many things must be covered in a sales agreement. Among the various issues, you must make sure that you have the right to get the boat surveyed. If purchasing an old boat you may decide to accept certain defects and not others. A clause for post survey negotiations should be included. You should know exactly which equipment is included. You may want to make the sale subject to financing. In some cases, when selling one boat and buying another you may want to make the purchase subject to the sale of your other boat. Other items to be covered in a contract are the hull or identification number; place of delivery of the boat; terms of payment; liability for loss before and after delivery as well as a satisfactory sea trial and engine performance as well as all onboard system testing results. Financing the boat has consequences that go well beyond the avoidance of cash outlays. Tax laws allow for the deduction of interest on certain loans. In many cases, interest on a loan on a yacht that can be used as a second home (or first home for that matter) may be tax deductible. Again, certain boats qualify as "second homes" while others, usually very small ones, do not. Financing a boat also means complying with the many requirements of a lender. For example, a lender may require that a yacht be kept at a marina and be covered by hull insurance. But someone with a free mooring contemplating the purchase of an old boat may not be interested in complying with the requirements of a lender if such requirements would make yacht maintenance unreasonably expensive. United States law offers two types of vessel identification: registration and documentation. The difference between state registration and Coast Guard documentation is meaningful only for certain uses of a yacht. Federal documentation makes sense for those traveling overseas and in international waters because it carries more weight than state registration. It also simplifies matters for those who use the boat in two or more different states for several months at the time. Insurance carriers often require documentation for large yachts. Federal documentation, however, does not relieve the owner of the sales tax liability in the state where the yacht is used. The procedure to document a vessel, although recently streamlined, still presents much more paperwork than state registration. Vessel insurance refers to two types of coverage: hull and indemnity. In other words, one covers the value of the yacht and the other the liability of the owner. The difference between "boat insurance" and "yacht insurance" is that in yacht insurance you get what is known as "agreed value." In case of loss, no depreciation is taken. Virtually all new vessels carry insurance while many older boats do not. As some skippers put it, "it's a better investment to put the premium money in an extra anchor." Insurance options are almost unlimited. Certain boats are uninsurable as are certain blue water passages or certain destinations. In the end, where the purchaser obtains free title to a yacht, it will be his call to determine what type of insurance, if any, is appropriate. Most insurance companies require a survey. A survey is also a good way to locate potential problems. Not all surveyors are alike, however. Check the references of the marine surveyor, such as accreditation and certification. One thing to keep in mind is that accreditation by a surveyors' organization does not provide any guarantees. In the event of mistakes by a surveyor which lead to the purchase of a defective vessel, the only real comfort will be an error and omissions policy covering the surveyor. Also, remember that surveyors have specialties such as rigging, fiberglass hulls, aluminum hulls, power or sail, etc. Very few surveyors in the United States do any form of computer engines analysis or compression testing on the engines and generator. If the plan is to charter out the yacht, appropriate arrangements should be made and a business plan should be prepared. Most charter companies, for example, do not take older or small boats into their fleets. This information should be on hand before a yacht is purchased. The financial and tax consequences of placing a yacht into charter service can also be significant. An accountant should be retained prior to making a final decision. As in the case of a charter, sharing the yacht is a decision which will seriously affect the use of the yacht. Along with the sharing of expenses, a sharing arrangement also calls for the assignment of rights and duties of the co-owners. Finding a partner for the ownership of a yacht is akin to finding a roommate. There is no substitute for the search of a compatible person with a compatible schedule and needs. But certain rules should be in writing in the form a co-ownership agreement. The agreement should spell out how and where the yacht is to be kept and used, how it will be financed and insured, who will provide the maintenance, who and when will use it, a conflict resolution clause and other items. The purchase of a used yacht presents a complication which is not encountered in real estate and automobile acquisitions. In addition to the regular liens of record such as mortgages, vessels are subject to maritime liens, also known as hidden liens. A person who has performed work on the yacht or provided services or supplies to it may have a claim against the vessel itself and therefore a lien. The owner of a lien on the vessel can bring a proceeding against the vessel itself (known as in rem proceeding because it is against the vessel) and cause the vessel to be sold by a federal Marshall. Some liens may be registered with the county clerk or other local authority where the vessel has been registered or used, but that is not always the case. Yachts can move and incur liability in areas that are very far from the point of sale. There is no certain way to identify all possible liens and the history of the vessel is usually the best way to establish clear title. Because the boat was donated to a non-profit foundation, the nonprofit needs to hold the title in their name for two years. If the nonprofit were to sell the boat within the first two years, then the sale has to be reported and the donor can only deduct the amount the foundation sells the boat for (usually less then the appraised value). It is very important that the party donating the boat or yacht, receives a written statement from the foundation, that the foundation will keep the vessel for two years. However if the nonprofit foundation sells the boat after the two year period, the sale doesn't have to be reported and the donor can deduct the appraised value (usually more then the fair market value). So, a 501c-3 nonprofit foundation can charter the boat to you for that two year period. Then at the end of the two years, you have the option to buy the boat. The charter/purchase agreement between that 501c-3 foundation and the charter/buyer guarantees you the option to purchase the boat at the end of the two year period. The party donating the yacht or boat, has the security of the foundation stating in writing to them, that it will keep the boat or yacht for the full two years. Let's say you bid $20,000 and win at $20,000. By the wording of your charter, you must pay 75% of the selling price ($15,000) and the 501c-3 foundation holds the title for 2 years. For those 2 years, the boat is officially, 'Chartered' to you. During which time you can operate, repair, or restore the boat at your own expense. At the end of 2 years, you can pay you the remaining $5,000 and the boat will be yours. Many boat owners, myself included, need to face the ugly fact that it will be necessary to winterize our boats against the icy blasts of a long New England winter. The discussion always comes down to this question: "Is the money you save this fall worth the risk of facing major damage next spring, in case you missed something?" It is my opinion - and I have an opinion on just about everything marine related, that unless you really know what you're doing, leave it to the pros! That said, I have a few reminders for those of us who are still going to do it ourselves. It doesn't matter if the engine has 5 or 105 hours on it since the last change. Today's oils do not wear out, but they do get contaminated with dirt, combustion residue and acid. Leaving any of these things to settle on your engine's moving parts, during the winter, is a bad idea. Run the engine until the oil gets warm, thus suspending all of the "bad stuff." Next, drain or pump it out, change the filter (including a new gasket), and put in the new oil. Caution: Do not over fill, as too much oil will cause all kinds of problems. Check the owner's manual for the manufacturer's recommendations on the type and amount of oil to use. 2. Add fuel stabilizer to your fuel and top off the tank. I only recommend a product called SEA FOAM which can only be purchased at a NAPA auto store. note that any "NAPA GOLD" products are the marine line and all "NAPA GOLD" marine product top the list when dealing with the marine environment. Run the engine long enough to ensure the stabilized fuel has reached your carburetor or injectors. 4. I/O Engine: If you have an I/O (inboard/outboard), drain the lower unit and check it for any sign of water contamination (a milky color instead of clear) and/or any metal shavings (gear damage). If all looks good, refill the unit with new grease. If not, get it repaired now! 5. Cooling Systems: Preparing your cooling system for winter depends on the type of system you have. Remember, always follow the manufacturers' instructions and use the following procedures only as a guide. Raw Water (Direct) Cooling System. Proper winterization of a raw water system should start with a thorough flushing of the system with fresh water running through the engine while it is running at normal temperature. This part is REALLY important if you have been running in salt water. First, disconnect the intake hose from the thru hull fitting and attach it to a garden hose. Note: if you have an I/O, you'll need a set of "ear muffs" to attach to the water intake on the lower unit. Remember, running an I/O for even a few seconds without water will destroy the impeller in the water pump! After flushing, drain the engine block, manifolds, risers and oil coolers by opening the petcocks on the various units. After all the water has drained out, close each petcock. Disconnect the garden hose from the intake hose and place the intake hose in some environmentally friendly ("Pink") antifreeze and drain the fluid by running the engine. When the antifreeze starts coming out the exhaust, shut the engine down. Closed (Indirect) Systems: These systems do not require annual draining and flushing of the closed part of the system. HOWEVER, the open part of the system DOES require the same procedures of flushing, draining and antifreeze infusion as previously described in the Raw Water (Direct) System. * If any of the above instructions seem to be confusing or over your head, that's probably the best clue that you need a professional to winterize your engine. * Also remember, if a pro lays up your engine and something goes wrong, next spring he has a problem. If you've done your own work, you have a problem! ROB SCANLAN IS AN ACCREDITED & CERTIFIED MASTER MARINE SURVEYOR CONDUCTING COMPUTER ENGINES ANALYSIS AND COMPRESSION TESTING ON GASOLINE & DIESEL ENGINES THROUGH OUT NEW ENGLAND. Let's start by describing the two basic sections of a typical boat or yacht insurance policy: physical damage and liability. The physical damage section covers accidental loss or damage to the boat and its machinery. This not only covers the hull and the engine(s), but also the sails and other equipment on board that are required to operate the boat. The liability section, sometimes referred to as P & I (Protection & Indemnity), covers your legal obligations to third parties. This legal liability can arise from bodily injury or loss of life, or damage to someone else's property, as a result of the ownership or operation of your boat. Liability coverage also helps pay for your legal defense if you are sued for a liability that may be covered under your boat insurance policy. Physical Damage � What Losses are Covered? Physical damage coverage generally pays for repairs to your boat that are necessary as a result of damage caused by a wide range of perils. The best policies provide "all risk" coverage, which means that if the cause of loss is not specifically excluded, it is covered. Typical causes of loss that are covered include: weather-related perils such as wind, rain, hail, lightning and wave action; fire; loss or damage caused by theft or vandalism; and collisions with docks, submerged or floating objects or other boats. It is wise to select a policy that continues to cover your boat while it is stored on land, or while you transport your boat over land by trailer. The boat owner has the responsibility to maintain their boat, and so normal wear and tear is often excluded under a boat or yacht policy. The number and type of physical damage exclusions vary from company to company, so take the time to compare to avoid surprises later. When comparing physical damage coverage, the most significant difference that can be found among boat or yacht insurance policies is whether the coverage is based upon "agreed value" or "actual cash value" (ACV) loss settlement. Agreed value policies normally pay the amount shown on the policy if the boat is considered to be a total loss. Under such a policy, damage resulting from a partial loss is generally paid for on a replacement cost (new for old) basis, less your deductible; that is, physical depreciation will not be factored into determining the value of the lost or damaged items. However, some items that are subject to higher amounts of normal wear and tear, such as canvas, sails, trailers and some machinery, may be subject to allowance for depreciation in the event of a covered loss. An actual cash value policy provides less coverage than an agreed value policy, but generally at a lower cost. An ACV policy provides coverage up to the current market value of the vessel in the event of a total loss, taking into account depreciation and the condition of the boat at the time of the loss. Payments made for partial losses are usually reduced based upon physical depreciation of the lost or damaged items, and the policy deductible is also applied. While an agreed value policy typically costs the boat owner more, and provides broader coverage, an actual cash value policy may suit the needs of an owner looking for an economical alternative. I discuss all options with my clients and their intended cruising plans. Two additional coverage�s often found in boat and yacht insurance policies are: Personal Property coverage, and Towing & Assistance coverage. Personal Property coverage includes such items as clothing, personal effects, and sports and fishing equipment belonging to you or your family while those items are being loaded/unloaded and while aboard your boat. Similar to physical damage coverage, there are exclusions that vary from company to company, so it pays to compare. Towing & Assistance coverage reimburses you for the costs that you incur when you need emergency assistance for your boat, and you and your boat are not in immediate danger. Some examples of emergency services that you may need which may be covered include: towing to a place where repairs can be made; delivery of fuel, oil or parts; or emergency labor while underway. The liability section of a comprehensive boat insurance policy provide many coverages that are important to boat owners. Coverage for the removal or disposal of the wreck of your boat is important to have, especially if the wreck is deemed to be a hazard to navigation. Boat owners may also be responsible for any containment and clean-up expenses resulting from oil pollution or contamination caused by their vessel. It's important that your boat or yacht insurance policy covers your liability for those clean-up expenses, which could add up to a considerable amount. If you ever intend to borrow someone else's boat, confirm that your liability coverage extends to the other boat. This is called "non-owned" boat liability coverage. Finally, boat owners who employ paid crew members should ensure that their policy covers their liability to the crew under the Jones Act and General Maritime Law. A good policy will also provide a separate coverage for your liability under the Federal Longshoremen's and Harbor Workers' Compensation Act. This will cover your statutory liability to temporary shore-based workers, such as a mechanic or marina employee, if they become injured aboard your boat. Most boat and yacht policies exclude coverage while your boat is chartered to someone else, or used to carry passengers for a fee. Under the right circumstances, a good marine insurance company may extend your coverage to include those situations. You should verify that your policy has an adequate limit of coverage for Medical Payments. Medical Payment coverage will pay for first aid treatment, ambulance, hospital and other costs that result from someone being injured on your boat, even if you are not legally responsible. It is important to ascertain whether the coverage also applies while someone is boarding or leaving boat, and while being towed behind your boat, such as while water skiing. Check to make sure that injuries to you and your family are also included in this coverage. Given equal amounts of insurance, coverage on a "per person" basis may be preferable to coverage on a "per accident" basis. Since boat liability insurance is not mandatory, there are many boaters operating without liability coverage. Uninsured Boater coverage is designed to compensate you for injuries to persons aboard your boat that are caused by an operator of another boat who has no liability insurance. If you are legally entitled to recover damages from the other uninsured boater, or if you or your guests on your boat are the victims of a hit-and-run boater who cannot be identified, this coverage can help ease the financial impact of those injuries. The underwriter must consider many factors when determining the rate (or premium) to charge for a boat policy. The most common determinants are: value, length, and age of boat; type of boat (i.e. power, sail); type of engines; mooring location; intended area of navigation; previous boating experience and claim history of the owner and the underwriter will also consider the automobile driving record of the owner(s), and whether they have taken any safe boating courses. There are several ways that you can reduce the cost of your boat insurance. The most common way is to select the highest deductible amount that you are comfortable with. In general, physical damage deductibles start at around 1% of the insured value of the boat, and can be increased to sometimes as much as 5%. Each higher deductible amount reduces your insurance premium. Think about how much you could affordably pay out of pocket if a loss occurred. Many yacht policies include a lay up period which is a time that the yacht is normally laid up and out of commission, such as during the winter months in colder climates. The underwriter will normally allow a discount for each month that the yacht is decommissioned. You can usually reduce your premium by requesting the longest possible lay up period that would be reasonable for your part of the country. Think about where you will actually be operating your boat. If you consistently navigate close to your home port, you should inquire whether a more limited navigational area on your policy can save you money. In other words, you may not need coverage for the entire east coast of the U.S. when you only operate your boat in Maine. The condition of your boat was also mentioned as a rating factor. If you own an older boat that is around 26 feet or larger, the underwriter may request a recent marine survey of your boat before quoting or insuring it. The better the condition, the greater the likelihood of its being approved for insurance and your receiving a competitive quote. Anything that you can do to update and repair critical systems prior to the boat being inspected may improve the results of the marine survey and leave a better impression with the underwriter. Lastly, installing certain safety devices on your boat can sometimes reduce the premium that you will pay. Some marine insurers will give credits for such safety items as: an automatic fire extinguishing system in the engine compartment, a fume or vapor detector in the bilge, or certain anti-theft alarm or tracking devices. Now that I have described some of the key elements of boat and yacht insurance policies, I hope that you are in a better position to understand marine insurance. It is also wise to call me for a thorough inspection or survey of your boat or yacht . �WHO DONATES BOATS, YACHTS OR SHIPS � ? Private boat and yacht owners as well as corporate and commercial vessel owners, who no longer need their boat, yacht or ship for several reasons, decided not to sell the vessel. This is particularly true if the donation value is higher than the current market value and the donor is in the income tax bracket that permits a tax deduction savings. Donations and tax laws are complex and each individual case differs. If you intend to donate the vessel, I assist you and consult with your CPA or tax advisor to answer question on your financial benefits. All tax-deductible contributions in excess of $5000 must be substantiated. I am an Accredited & Certified Master Marine Surveyor and I can furnish you with the IRS Publications and Guidelines for donating the boat, yacht or ship. As an Accredited & Certified Marine Surveyor, I appraise these vessels for donation purposes. My appraisal forms are well respected and accepted by the Internal Revenue Service and by every 501c-3 foundation through out the United States. Before you speak with any foundation on donating that boat, yacht or ship, call me to discuss the tax benefits and the process for donating the vessel. How small of a boat would you check out for me and my brother and do you think we are to young to own a small boat and have you check it for us. I am 15 and my brother is almost seventeen. SO MANY OF MY CLIENTS ARE ALL AGES AND HAVE INTERESTS IN ALL SIZES OF BOATS AND YACHTS. OF COURSE I WOULD BE GLAD TO INSPECT THAT BOAT FOR YOU AND YOUR BROTHER. LET ME INTRODUCE YOU TO ONE OF MY YOUNGEST CLIENTS. What's the difference between the green and orange colored anti-freeze/coolant? Green antifreeze means that it is an IAT (inorganic additive technology) formulation. It has a 3 year recommended anti-corrosion additive life and no anti-cavitation additives unless specifically rated for diesel engines. Most of them aren't. Orange antifreeze like Shell Dex-Cool is an OAT (organic additive technology) that has a 5 year additive life and a high quality anti-cavition inhibitor for gasoline and diesel engines. The (2) types should not be mixed. Doing so negates the benefits of the Dex-Cool extended life and anti-cavition inhibitor. IAT might be fine for winterizing marine engines and exhaust systems, but it is not the optimum choice for the engine's closed cooling system itself. Mixing the IAT and OAT in a power boat however where the engines are the prime movers, cavitation vortexes will over time drill pin holes in the engine blocks. If boating will be a family activity, members of the family should be involved in choosing the boat. Will it be a fishing boat most of the time? A water-ski tow machine? The basic picnic cruise boat? Determine what it is the family wants the boat to do, then go find the model to fit those needs. Most boats are multifaceted � they can be fishing boats in the morning and ski boats in the afternoon. Make notes of the family's "must haves," and "can do with outs." Determine your monthly budget for boat ownership and try to stick to it. But, don't give up a necessity for a few dollars that will cost you convenience or usage later on. Remember that you will often be inviting guests aboard, so plan a little extra room for them and for you. Many boats are now being prepackaged with motor and trailer as a complete unit. The manufacturers have been careful to outfit such products for the comfort of the average boater ... and the attractive prices of these units reflect cost savings passed on to buyers. Generally, the packaged boat units will offer some power choice, so make sure there is enough push. Don't go overboard, either; too much power can be "fuelish," costly or simply unsafe. Remember that the dealer that sells the boat will be your partner for advice and service. He or she should be willing to listen to what you want in a boat, then make several recommendations. When the boat needs scheduled service or repairs, the dealer should be there to stand behind the sale. When shopping for a boat, also shop for the dealer you feel most comfortable with or one recommended by me. Finally, don't think you're making a lifelong commitment to a particular boat. It's not a marriage; it's more like an enjoyable relationship. That's because most boat owners trade up as their skills grow and needs change. All my clients, buying boats or yachts, know that I am no more than a phone call away to assist them in the right boat. Let my 36 years marine experience work for you and your family. Boat Safe and Boat Smart. What are the guidelines for money held out in escrow on purchasing? During the winter months, or lay-up period here in New England, Escrow funds are put aside for the sea trials that are usually conducted when the spring rolls around and the yacht is launched. Over the past 12- 14 years, I have been able to run the gasoline or diesel engines in my pre-purchase surveys during the winter months. Engines built 6 -8 years ago have data ports that I can plug my SCAN-TOOLS or computer into to get operational readings and then do my compression tests as well as additional independent test readings on the engine and genset.I will lubricate the shaft strut, cutlass bearings and stuffing box so I can run the engines in and out of gear repeatedly. After full warm-up I will read the helm gauges, but rely mostly on my own instrumentation gauges and computer read-outs. After all my tests are completed I re-winterize the engines and genset. An escrow account is set up to hold funds for the sea trials to follow later in the spring. What happens after the yacht is purchased and money put in an escrow account is insufficient to cover addition mechanical or operational problems that might develop during the sea trial? You can not go back to the selling party or broker and report that there are unforeseen or undetectable problems and that the escrow amount is not sufficient enough to cover the problems. ~~ Your client already owns the yacht. Who makes the determination of how much should be held? In very pre-purchase survey I conduct I make the determination as the attending surveyor. Not the selling party. Not the broker and not my client. This is made loud and clear to all the parties concerned that it is me, the attending surveyor who makes the determination of the escrow amount and that the money is not just for mechanical systems. No outside arbitrator will be involved and all parties agree to this. I have never, ever had a situation that escrow money I recommend to be held was not enough. Can I get a little input from any of you? Your thoughts and opinions. You undoubtedly have heard in the media that as of January 1, 2005 the tax laws have changed regarding the charitable donation of vehicles. Because I have had numerous inquiries regarding the impact the new law will have on yacht and boat donations, I would like to take this opportunity to explain the changes. Ultimately, I anticipate minimal impact on the tax deductibility of boats being donated to the 501 C3 foundations. The new law, which was aimed primarily at automobile donations, affects cars, boats, yachts and airplanes, which are grouped together in the tax code. It states that the deduction value of a donated vehicle is limited to the amount for which the charity sells that vehicle on the open market. Most individuals donating cars have valued their donation based on Blue Book or similar listings while the true street sales value might be a fraction of the book value of the car. The reputable 501-C3 charities accepting boat and yacht donations, have always held title to these vessels for a minimum of two years before selling them outright. The IRS has not written any new regulations as to how long a charity must hold title to a donated asset before this deduction limitation no longer applies, I feel, based on direct conversations with the IRS, that the current two year holding rule will continue to apply. Currently the donor of a vessel with an appraised value in excess of $5000 submits an 8283 tax form to the IRS showing the appraised value verified by an Accredited & Certified Marine Surveyor. I have these forms and the charity receiving the vessel, must sign off on the acceptance and certify that if it sells the vessel within two years, it will report the sale price to the IRS. After two years there is no reporting requirement as the donated asset is considered depreciated to a point where the appraised value is no longer meaningful. If for some reason the IRS should take the gigantic step of completely changing their existing procedures and tax forms for charitable donations of boats, I would be notified immediately. Donating your boat, yacht or commercial vessel is still a very viable financial alternative to an actual sale with many tax deduction advantages. Please call me if you have any questions about the new tax law and how it might relate to donating your boat or yacht. CAN YOU GET A GOOD DEAL ON A DONATED BOAT ? ARE THESE GOOD BOATS TO CONSIDER ? Understand that these donated boats/yachts/ships are takin in by foundations as assets and not liabilities. Although the yachts and ships; (yes ships are donated also) that I appraise have been looked at by a representative of that foundation to determine if that foundation wants to accept it. Recently, I had a call from a marina wanting to donate "a few boats". I went to appraise the boats which turned out to be abandoned wrecks and no foundation would take them. I instruct all of my clients donating yachts and ships to have all maintenance logs, receipts and paperwork available for my inspection on the date of the appraisal. You will in fact need a "Condition and Valuation" survey done on any donated vessel you intent to charter/purchase because the appraisal done on that vessel is for " Donation Purposes Only". No bank, financial institution or marine insurance underwriter will accept the "Donation Appraisal" for financing or underwriting. Keep me posted and feel free to call the office. power boats and sailboats, board another 225, drive into over 200 shipyards and yachting facilities and marinas and speak with over 1500 prospective owners every year. If you're serious about getting the right powerboat or sailboat at the right price, I should be working for you to protect your best interest and your investment. What's the best yacht or boat for your needs and budget? How much are the options worth? What should the initial offer be? If you're confused about the right boat for you or how to strike the best possible deal, this is what the initial part of retaining my services includes prior to the actual survey inspection. Even experienced boat owners are baffled by the scope of what I do during the testing, analyzing and compression testing of the engines and generators as part of the sea trial. There are very, very few certified and accredited marine surveyors in the country that do any form of engine and generator testing in the survey inspection other than reading the helm instrumentation gauges during the sea trials. I am in the engine room during the sea trials with all my gauges, meters and computers doing a full computer engine analysis on the engines and generators. installed? PC-based navigation system or chart plotter? Dedicated weather fax or PC connected to SSB? Which generator is best? A general guideline is 15-20% of the boat value is tied to electronics inventory and gear. Making the wrong decision is an expensive error. A potential boat purchaser has asked Rob the following questions. I am looking at buying an older sailboat. The question I have is it has a forced air RV heater installed, made by suburban. It is well done but are these type heaters allowed to be used in boats and will it pass a insurance survey. Thank you for your time. It depends on how this heater system was installed. Is the system diesel fuel fired or LPG (Propane gas) fired? Either way, the two systems must meet ABYC (American Boat and Yacht Council); NFPA (National Fire Protection Standards) and USCG safety standards. If the current owner of the sailboat had it professionally installed it is probably installed to meet these standards. You must also have Carbon Monoxide detectors installed in the living/cabin areas of the boat. I would like more information from you about the manufacturer of the heating system and hopefully the company that installed the system. Discover the world of boating fun and freedom trailering offers. The ability to trailer your boat opens up a world of boating adventures. Trailer boating is convenient- a trailered boat can be transported just about anywhere. It's also cost effective-when you consider the cost of slip fees, bottom paint and blister repairs, trailering offers an affordable alternative. Following a few simple guidelines will ensure your towing experiences are safe and positive. When you purchase a new boat, don't skimp on the trailer�remember your boat will spend a great deal of its life on the trailer. Choosing the right trailer will get you and your boat anywhere you want to go safely and easily. When transported on a trailer, your boat should be supported across the hull, with the weight of the hull, engine and equipment evenly distributed. A trailer that doesn't spread support evenly can actually damage the boat hull. The capacity of the trailer should be greater than the combined weight of the boat, motor and equipment. Keep in mind that trailer ratings are maximum capabilities-running a little below the maximum will extend your vehicle's life and offer peace of mind. Purchasing a trailer one size bigger than your present boat requires will accommodate the occasional extra-heavy load; any larger though and your boat may not be properly supported and the trailer will be awkward to tow. It's important to match up the tow vehicle and the trailer. The tow vehicle must be capable of handling the weight of the trailer, gear and boat-including fuel and water, plus passengers and equipment carried inside the tow vehicle. Painted trailers are recommended only for freshwater use. Galvanized steel offers better long-term service in saltwater. Practice makes perfect-before heading out practice braking, turning, backing up, etc. on a level, open parking area. Avoid making sharp turns or sudden moves when trailering a vehicle; be patient and adjust your steering slowly. Once you're on the road, leave plenty of room ahead, behind and beside you to compensate for the extra weight of your boat and trailer. Pulling a trailer means you need to brake earlier, applying firm steady pressure to the brakes. You also need to turn wider; the trailer will cut corners more sharply than the tow vehicle. To avoid scrapes and dings, enlist an extra pair of eyes for backing down ramps or parking. As a courtesy to others, get your boat ready for launching away from the ramp. Before launching, be sure that your boat's drain plug is secure. Keep the tow vehicle's rear wheels out of the water to ensure its exhaust pipes remain dry. On most ramps, a good rule of thumb is to back the trailer into the water until the front of the fender is at water level. Flat ramps may require you to go further, while on steeper ramps you may not need to go as far. Set the parking brake; tire chocks behind wheels provide an extra measure of safety. Lower the engine, start and warm up. 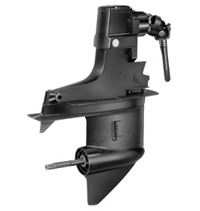 Disconnect winch hook from bow and proceed to launch with a light shove or by backing off the trailer. Move away from ramp to finish loading your boat. Reverse launch steps to remove your boat from the water. Pay attention to changes in wind direction, velocity, current and tide. Note boating traffic and general visibility. Don't submerge trailer too deeply; maneuver boat to trailer and raise the engine. Secure the boat with the winch hook before pulling the boat to the top of the ramp. This information is intended to be used as helpful hints, not definitive instructions for operating and maintaining a boat trailer. For complete instruction, maintenance and safety guidelines, refer to the trailer's Owner's Manual. Modern navigational instrumentation both on board and ashore have made tragedies at sea very infrequent. It is easy to forget the tragedies and loses that our ocean imposed in earlier Maritimes. It is estimated that in the late 18th century six out of every ten mariners perished at sea. According to New England naval historian Edward R. Snow, who documented 9,200 wrecks and more than 650 storms from 1630 - 1942, there are three ordinary storms every year; a �snorter� about every five years and a terrific gale each quarter century. Our Nantucket shoals, which is the narrow waters between Martha�s Vineyard and the Elizabeth Islands , and the shallows around our Cape Cod made this area almost as extensive a graveyard for ocean-going vessels as the Carolina Capes. In the last half of the 19th century, more than 2,000 ships foundered on Nantucket �s shoals; an average of 40 per year. One such loss was the H.M.S. British Queen on December of 1851 after being at sea eight weeks with over 200 Irish immigrants as her passengers. Thankfully, all but two were rescued and cared for by the islanders. From Main to Block Island the harbor entrances were protected by over 90 lighthouses not including beacons and ranges. The first was built on Little Brewster Island , Boston Harbor in 1761. Cleveland Ledge marked the east side of the entrance to the Cape Cod Canal and this was built in 1941, the last major beacon erected in Massachusetts . Opening of the Cape Cod Canal eliminated the bad weather voyage around Provincetown and reduced the number of shipwrecks significantly. As all mariners navigate our New England waters today, you all must remember those who came before you, the dangers they faced and the heroism they portrayed. We all literally to this day, sail over the bones of history. I notice that motor yachts are built on a modified-V hull while trawlers are constructed on either a semi-displacement or a full displacement hull form. What's the difference? In general, motor yachts are built on the same kind of all-purpose modified-V hull forms used in the construction of many sportfishing boats. A modified-V hull-with its moderate transom deadrise and hard chines-provides a combination of performance, comfort and stability not available with any other configuration. It's a compromise, but a good one. The difference between a modified-V hull and a semi-displacement hull is oftentimes difficult to distinguish. In general, the semi-displacement design places less emphasis on performance in favor of economical, lower-speed operation. The chines are sometimes softer and a true semi-displacement hull is often narrower of beam than a modified-V design. These hull forms offer little fuss in the transition from displacement speeds to planing speeds, and they can operate efficiently at the transition speeds of a conventional modified-V model. Other semi-displacement designs are trawler-types capable of speeds above hull (displacement) speed but not necessarily in an efficient manner. Semi-displacement hulls are most often seen on trawler-style boats (Grand Banks, Albin, Marine Trader, etc.) as well as many of the DOWNEAST designs from New England builders. Seldom capable of 20+ knots top, they provide an economical and comfortable ride at less than motor yacht cruising speeds. Full displacement hulls are seen only in true trawler designs. A displacement hull is characterized by rounded bilge and deep, full-length keels. Note that a true displacement hull cannot exceed its so-called hull speed which is calculated by multiplying the square root of the hull length by 1.13. The Krogen 42 and Nordhavn 46 are examples of true displacement boats. Beam is important to us since we want as much interior volume as possible in a boat. Some models we've been aboard recently seem cavernous inside, and their beams were unusually wide. The question is, how much is too much beam? Although modern production boats clearly have more beam than their predecessors, many yacht designers still consider one foot of beam for each three feet of length close to the ideal length-to-beam ratio for yachts under fifty-five feet. Having said that, the fact is that most modern production boats have beams that exceed that 3-1 ratio. It's not unusual, for example, to see a 36-footer with a 13-foot beam or, say, a 45-footer with a 16-foot beam. Did you ever wonder what that strange series of letters and numbers on the transom of your boat are. All boats manufactured or imported boats on or after November 1, 1972 must bear a HIN. The HINis a 12 character serial number that uniquely identifies your boat. The HIN has an important safety purpose. It enables manufacturers to clearly identify for boat owners the boats that are involved in a defect notification and recall campaign. A HIN is not the same as a State registration number, which may be required to be displayed on the bow of your boat. The HIN is a Federal requirement; your boat�s registration number is a State requirement similar to the license plate on your car. The HIN, however, is required to be shown on the State certificate of registration. The boat manufacturer must display two identical hull identification numbers, no less than one-fourth of an inch high, on each boat hull. The primary HIN must be permanently affixed (so that it can be seen from outside the boat) to the starboard side of the transom within two inches of the top of the transom, gunwale, or hull/deck joint, whichever is lowest. On boats without transoms or on boats on which it would be impractical to the transom, the HIN must be affixed to the starboard outboard side of the hull, aft within one foot of the stern and within two inches of the top of hull side, gunwale, or hull/deck joint, whichever is lowest. The starboard outboard side of the hull aft is the preferred HIN location for many manufacturers. On catamarans and pontoon boats the HIN must be affixed on the aft crossbeam within one foot of the starboard hull attachment. other hard materials like oak wood. A maker of scrimshaw is called a scrimshander. as they journeyed to and from the whaling grounds. sailing vessels, mythical mermaids, sea birds and sharks. companionship or generally try to sell their works. and laptop emails, scrimshaw is all done ashore. and air-conditioned studios along our seacoast. locknut. Which nut goes directly against the propeller hub? nut. Thus the top or outer nut actually takes all of the load. propeller shafts, which clearly shows the half-height nut against the hub. If you go to any marina with the boats hauled for winter lay-up. Over 90% of the prop nuts will be on the wrong way. I wouldn't worry too much about the nuts being on backwards. It has proven sufficient, but you might as well put them on correctly next time you install a prop. Rob Scanlan is a U.S. Master Marine Surveyor and the above article was by Dave Gerr, NA. Forty three years ago the ANDREA DORIA and the STOCKHOLM , sleek Trans-Atlantic liners, collided off Nantucket Shoals; about 50 died. The STOCKHOLM was severely damaged and the ANDREA DORIA sank. The ANDREA DORIA now lies in 225 feet of water 50 miles south of Nantucket , Massachusetts . Although the events leading up to the collision are known, both ships� courses and positions were not and because of the circumstances, officials will never know which ship�s crew member�s statements were the accurate ones. The ANDREA DORIA was westbound for New York in thick fog and darkness. She had slowed from her 23 knot cruising speed to 21 knots due to the intense fog. The STOCKHOLM was eastbound from New York cruising at 19 knots. The ship was not in fog and the crew did not know that fog was ahead. The two ships spotted each other on radar over ten miles away and both recognized that they were closing near at head-on but both anticipated a routine passing. The ANDREA DORIA�S bridge officers thought that they were slightly starboard to starboard and the order was given to steer further to port to increase the starboard passing clearance. The Stockholm �s bridge officer treated the meet as a head-on one and acted accordingly. He ordered the helmsman to starboard to in fact create a safe port to port passing. Both ships in fact veered south; closer to one another. The Andrea DORIA had an advanced radar for her day but no plotting device and in so close a situation a plot would have revealed the imminent danger. The STOCKHOLM �S bridge officer was waiting to sight the other ship�s lights to take the proper action but realized that the Navlights were obscure by the fog that only the ANDREA DORIA was in. The two ships sighted each other less than two miles with a combined speed of 40 knots. The ANDREA DORIA�S Captain, Pietro Calamai, made a fatal command and ordered the ANDREA DORIA �all left� at full speed to try to outrun the fast approaching STOCKHOLM because it would have taken over three miles to stop. He put the ANDREA DORIA in front of and broadside to the STOCKHOLM . STOCKHOLM �S reinforced bow penetrated 30 feet into the ANDREA DORIA�S side. After the ships broke free, the ANDREA DORIA heeled over and listed heavily. STOCKHOLM �S anchor chains dropped from her crushed bow to the ocean floor and kept her in that position. The ANDREA DORIA�S officers realized that she was in danger and the first Morse code calls went out. The ANDREA DORIA�S severe list made it impossible to launch the portside lifeboats and the STOCKHOLM �S captain would only launch half of her boats being unsure of his own ship�s fate. Other ships rushed to help. The IDE DE FRANCE raced to the area in less than three hours and positioned herself about a half mile to windward forming a calm sea condition and the lifeboats ferried between the two ships evacuating 1500 people to safety. The ANDREA DORIA sank about eleven hours after the first MAYDAY went out. ANDREA DORIA was a beautiful ship with a fatal flaw. It was revealed that she only met 1948 SOLAS stability requirements. To meet those requirements, the ANDREA DORIA�S deep tanks had to be filled with seawater as they were emptied of fuel and fresh water. To save the cost of cleaning the tanks before refilling, the Captain often left them empty as they were then. Because of this, the ANDREA DORIA had one-third of her required stability at the time of the collision. She healed over to much and listed to heavily so water flooded over the tops of her watertight bulkheads and this flooded one compartment after another. Perhaps the ANDRIA DORIA was doomed anyway because only two years later, the birth of Trans-Atlantic jet service severely harmed the ocean liners. Many ships though ended up as scrap or as aging hulks except the QE-2 which was the last of her kind. The average marine gasoline engine runs for 1,500 hours before needing a major overhaul. Marine diesel engines will run for more than three times that long and log an average 6,000 hours under the same conditions. The number of hours that a marine engine runs is very dependent on maintenance schedules over the years. Gasoline-fueled marine engines will run fine for the first 1,200-1300 hours. It is at this point, the engine starts to exhibit small problems. If these small problems aren't addressed, they can turn into major problems. Marine engines normally work harder and well-maintained gasoline engine run under the best conditions, may run for more than the 1,500 hours without major overhaul. However, many marine engines running under the most demanding conditions of salt air, damp bilges, intermittent operation and pure neglect will certainly die early. Diesel engines are built to finer tolerances than gasoline engines. They will accept much more abuse and often deliver, if well maintained, 6,000 hours of hard work before a major overhaul. A well-maintained diesel engine may last the life of your boat. Since the average New England recreational boater logs only about 125 hours per year, the 6,000 hour diesel would last 48 years. Marine diesel engines add considerable cost to a boat, they should be seriously considered because of their durability, economy of operation and safety. Diesel fuel has a much higher flash point than gasoline and does not present the same threat of explosion that gasoline fumes carry. Engines like to run long and steady. The shorter the running time between stops, and the longer the idle time between runs, the fewer the hours they will deliver before needing major repairs. The adverse conditions under which marine engines operate have a great deal to do with their longevity. What they really need is rarely what they get. Engine compartments should be supplied with lots of dry, cool and clean air. The very minimum fresh air vent area (in square inches) for natural ventilation without blowers is found by dividing engine horsepower by 3.3. Two of the most important rules of thumb for engine compartment blowers on gasoline engines are that they should always be set to exhaust, not to blow air in, and they should be run for a minimum of 5 minutes before starting the engine. Two indicators that can alert you to potential trouble are the color of exhaust smoke and changes in the appearance of your oil when you check it. Exhaust gases from marine engines should be clear. Any color of smoke can warn you of potential trouble. White smoke indicates either water vapor from dirty fuel, a water leak into the cylinder or atomized, but completely unburned, fuel. Air in the fuel can also cause white smoke. You can not check the level and condition of your oil in your engine too often. You should check it before every start. It is also a good idea to wipe the dip stick clean with your bare fingers and feel the consistency of the oil. Use the paper towel to wipe your fingers. You should rub the oil on the stick lightly between your thumb and index finger and feel for any foreign particles which could indicate contamination or metal parts failures. Weekend boaters checking the oil before starting should be suspicious of oil levels that are too high or too low. Too high a level might be a clue that water has found its way into the oil sump. You could crack the cylinder head, break a piston, or both, just by turning the engine over. The oil with water in it will also look "milky". Too low a level could indicate an oil leak that could lead to engine seizure. Look in the bilge to see if there is any oil residue. Many marine engines sit very low in the bilge and water is consistently in contact with the oil pan. Over the years this can corrode and cause pinhole leaks in the pan. Whenever there is a large deviation from normal, take that as an urgent warning. Start looking for more clues or call me to do a full engine analysis and compression testing of your engines to be absolutely sure. So you are going to buy a boat! If you have decided to by a new boat you will in all probability go to a dealer. If you are looking for a used boat, the usual choices are buying through a broker or directly from the current owner. The obvious advantage in buying a used boat is that you will pay less for a same-size or larger used boat than for a new one. You will in fact get more equipment and a time proven hull. On the other hand, buying a new boat allows you to enjoy your boat longer before major repairs are required. When you sell it, the boat will be worth more than the used one you have kept the same amount of time. New boats often incorporate technological advances and the manufacturer warranties against such problems as hull blistering. Most new boat manufacturers sell through dealers. A good reputable dealer knows his product and knows it well. He should give you a "package deal" including the boat plus the USCG safety gear; basic electronics, services such as advice on financing, insurance; commissioning of the boat and instructions on how to use all the systems and warranty back-up information. If you intend to buy a used boat from a current owner you will in fact save the broker's commission which is usually 10 percent of the selling/purchase price. Understand this a very important issue on buying any used boat, nothing guarantees the seller's integrity; there is no "lemon law" and you are on your own. An experienced used boat broker will be familiar with current selling prices and the broker should be able to computer-search and prescreen boats for you. The broker should provide you with business help, advice on financing and establish an escrow fund for your down payment. The broker should furnish you a "listing sheet" of the boat with a detailed list of the equipment inventory and gear to be included in the purchase; preparation of your offer, contract and closing paper work. In many instances I have found that the buyer and seller have unrealistic expectations and the broker has often renegotiated a reasonable price after my survey had been completed. If you use a used boat broker or a new boat dealer, choose carefully. Screen several and look for one who is a good listener and one who is familiar with the type of boat you want. Consider recommendations from recent boat buyers, the length of time a dealer or broker has been in business and for any new boat dealer, how long they have carried the manufacturer's line of boats. Then choose just one. If dealers or brokers discover you are working with more than one, they will in fact slow down their efforts. Above all, be honest about your budget and time table. Take your time researching that one boat you intend to buy. You should request a copy of the last survey and copies of all maintenance logs and receipts. Feel free at any time to rely on my extensive library and reference materials on the boat of your choice. power boats and sailboats, board another 225, drive into over 200 shipyards and yachting facilities and marinas and speak with over 1500 prospective owners. If you're serious about getting the right powerboat or sailboat at the right price, I should be working for you to protect your best interest. Rob Scanlan is a Certified & Accredited Master Marine Surveyor covering Maine to Long Island, New York. Take a moment out right now and cruise this website. 1. Wash and wax the exterior, polish any metal, refinish any woodwork, repair or replace canvas and cushions. 2. Clean the interior thoroughly, steam clean or replace carpets, clean upholstery or re-upholster. Unwanted odors must be removed especially from the head, so get some air fresheners and disinfectant. Any personal effects or items that make a boat look cluttered should be removed. 3. After the initial cleanup, schedule regular wash downs to keep a boat in top shape. Consider cleaning the exterior/interior every two weeks and the bottom should be clean of any marine growth and a new application of bottom paint. In addition, a seller should consider having me conduct a marine survey before launching a marketing campaign. Knowing the strengths and weaknesses of a boat will save time, energy and money later. I can determine if a boat needs repairs and furnish a list of items that need to be fixed for the boat to be in top condition. Buyers are looking for a boat that has been well maintained with receipts and maintenance log available; so uncovering any potential structural or mechanical problems early gives you the opportunity to have them corrected and command your selling price. 1. A boat must be in top mechanical condition before launching a serious marketing campaign. Have the engine(s) and generator checked out by me and make all necessary repairs. Clean and paint the engine(s) and steam clean the bilge. 2. All equipment, wiring systems and electronics must be in good working order. Repair or replace items that are not. Also, insure that all safety items such as navigation lights, horns and bilge pumps are in good working order and all USCG safety gear is current. Remember that all offers are subject to a marine survey, sea trial and mechanical survey. Buyers must be satisfied by a boat's condition, performance and eye-appeal to complete the purchase. Please call or email me if additional information is needed about preparing a boat for sale. ROB SCANLAN IS A MASTER MARINE SURVEYOR SERVING COASTAL NEW ENGLAND, CAPE COD AND THE ISLANDS.